Heat oven to 375ºF. Spray 24 mini muffin cups with nonstick cooking spray. In small bowl, stir Bisquick mix and butter until blended. Add boiling water; stir vigorously until soft dough forms. Press rounded teaspoonful of dough in bottom and up side of each muffin cup. 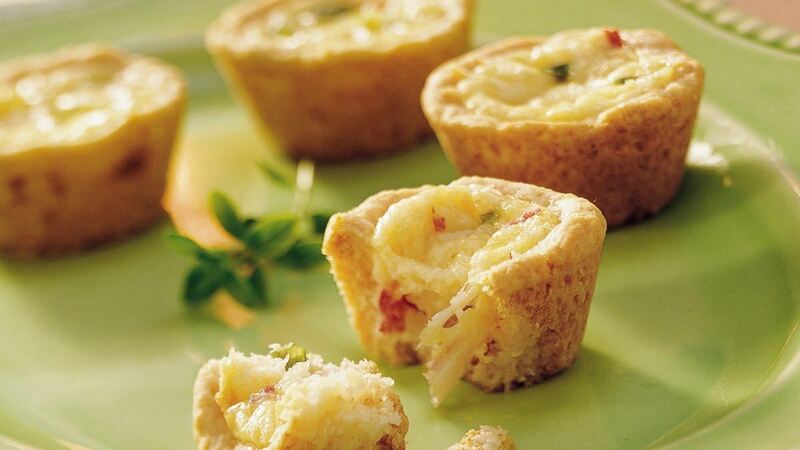 Divide crabmeat evenly among muffin cups. In another small bowl, beat half-and-half and egg with spoon until blended. Stir in onions, salt and red pepper. Spoon 1 1/2 teaspoons egg mixture into each muffin cup. Sprinkle cheese over tops. Bake about 20 minutes or until edges are golden brown and centres are set. Tip: Make quiches one day ahead; remove from muffin pan and place on cooling rack to cool. Store tightly covered in the refrigerator. To serve, place on baking sheet and cover loosely with foil. Reheat in 375 F oven about 10 minutes or until hot.